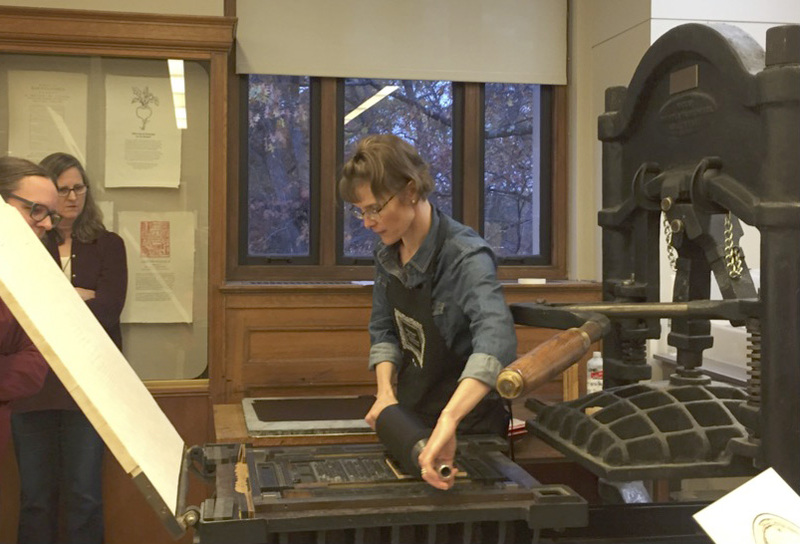 Katherine Ruffin demonstrates printing on an iron hand press in conjunction with the Protest in Print exhibition at the Davis Museum, Wellesley College, November 7, 2017. The standing-room-only crowd of over fifty attendees learned about the bookmaking practices, personal histories, and artistic philosophies of two book artists: Katherine McCanless Ruffin who shares her passion of print and paper with her students at Wellesley College and Carolee Campbell who realizes her vision of the ideal book through thoughtful concept and high craft. Katherine’s teaching practice at Wellesley College is informed by her reading and research, providing her students (and herself) with idealism and grit to see an ambitious project through to completion while being conscious of the materials, and simultaneously aware of the aura of the book. The Book Arts press was founded in 1944 by Hannah Dustin French, while the Book Studies program was begun in 2010, and now includes a bibliography course for undergraduates. Katherine runs the press and teaches single-handedly, allowing her to separate the importance of the physical activity and necessary research rather than focusing on the perfection of a student’s finished product. She showed us images of Wellesley’s newly renovated book arts lab and the reading room in the library’s special collections where students look at text and images as inspiration for their own creation. Students have the opportunity to make paper, compose and print books or broadsides, and Katherine has also hosted faculty sessions in which instructors learn the possibilities and skills necessary for printing. Not surprisingly, there have been some challenges, including a grant-funded project to collect plant material in and near campus for papermaking that required the close collaboration with of Wellesley’s Health and Safety officers (drawing a chuckle from the papermakers in the audience), and a printing demonstration on a wonky hand press that forced Katherine to print copies ahead of time. These challenges do not (and should not) deter the epistemological purpose the book arts program. Students are inspired by these courses to continue their studies and look at careers in cultural heritage institutions. Having the opportunity to make books by hand gives students an understanding not just of materials, but philosophical foundations of craftsmanship, creativity, patience, and tradition. The Real World of Manuel Córdova. Ninja Press: Carolee Campbell. Carolee began her career as a book artist without a specific literary agenda. She inaugurated Ninja Press focused on investigative bookmaking and design, particularly for her photographs. Using nineteenth-century photographic techniques with accompanying poetry quickly led her into research which she enjoyed. She reflected back on those books and admitted that before 1995 she was unable to produce her own concept of the ideal book. That was the year she learned about W.S. Merwin’s poem, “The Real World of Manuel Cordova.” This poem was inspired by events in 1907 between the Amahuaca tribe of the Brazilian Amazon and the herbalist, Manuel Córdova-Rios. Carolee explained how she became engrossed in research, collecting images, colors, and textures that evoked the jungle, along with its topography and the iconography of the face and body painting of the Amahuaca. She found that she had gathered a lot of information but still did not have a clear direction on how to turn the poem and its story into a book. Stepping back from the imagery and thinking about the journey—both her own and that of Córdova-Rios—helped give her direction. She chose Victor Hammer’s Samson typeface which—because of its shape and eclectic letterforms—requires the reader to read the text at a slower pace and take their own journey through the poem. The type she acquired was cast imperfectly, requiring a lengthy process of hand-kerning. 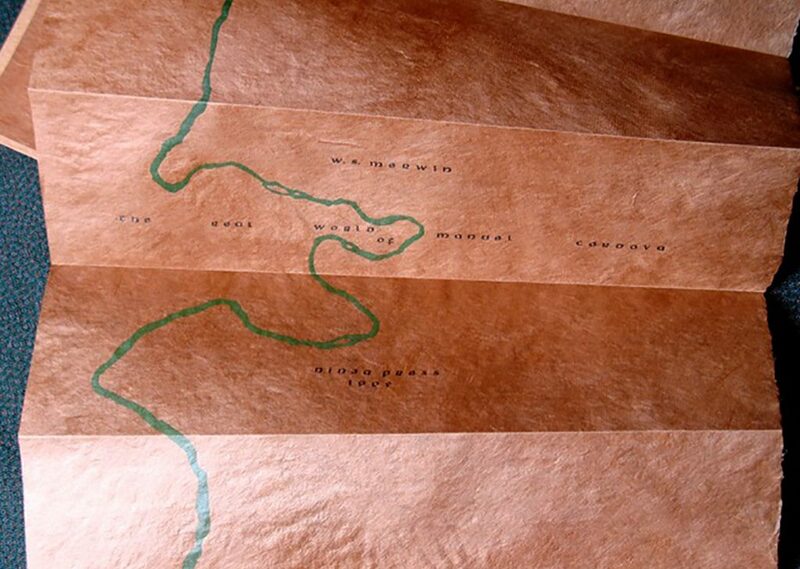 Her last decision—to use an image of a river to suggest a journey, which in turn suggested a map that cemented her decision to make the structure an accordion-fold—came about after some frustrating attempts to use the outline of the Amazon as an illustration. She went back to the poem and realized that Merwin never mentioned the Amazon, the Amahuaca, or the jungle. This revelation was her permission to use the outline of the Green River in Desolation Canyon, which has similarities to the flow of the Amazon, but the topography was a better match. She then reset the poem, with Merwin’s permission, to follow the curves of the river, which she inked with a hand brayer to make gradual color shifts down the length of the poem. Carolee admitted that this was the first time she came close to producing her ideal book. She was able to achieve this by winnowing away everything but the essence of the poem and providing a tactile experience for the reader through careful choices of paper, ink color, typography, and book structure. 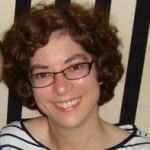 Nina M. Schneider is the Rare Books Librarian at the William Andrews Clark Memorial Library, UCLA. Her particular interests include bibliography, the history of printing, description, and representation and casually collects printing manuals from the mid-20th century. She recently completed a second Master’s degree in Early Modern Studies from University College London. She was APHA's President from 2016-2018, and has been active in APHA for a number of years in various capacities at the national-level, as well as in the New York and Southern California chapters.